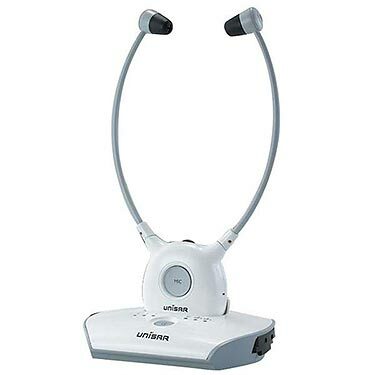 The 2.4GHz wireless Unisar DH900 TV amplifier listening system with under-the-chin stethoset-style headset receiver is designed to wirelessly enhance sound from your TV and other audio sources. The TV amplifier's headset receiver features a mute button that turns off sound from the DH900 transmitter and turns on the built-in microphone for amplifying conversations around you. Not good for me. It whistles. Wear phonak cross. Left ear some hearing, right ear no sound.